W. Gordon Allen, the writer, producer, and host of this documentary, takes himself and the material presented here VERY SERIOUSLY. 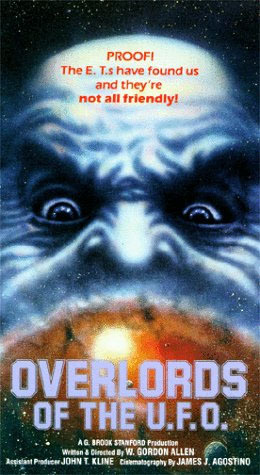 This is the film that dares to ask the burning question, “Who are the overlords of the UFO?” Why is it worded that way? I don’t know. While this is a rather dry presentation and gets a little dull at times, Overlords of the U.F.O. is pretty intriguing. The best moments are the artistic recreations of various incidents of sightings and abductions. However, my favorite bit is the information provided by communications from aliens of the planet Ummo. This stuff is just so wild and so much damn fun. Your enjoyment of this documentary will depend entirely on your interest in UFOs and the US government’s attempts to cover up these incidents.